3 Company is into making plastics products. The main cost is raw material which amount to around 65% of the revenue. GP is respectable seeing the nature of the plastics products industry. GP is on the rise of last 2-3 years.It is due to the fact the company is concentrating more on value added products which have higher margins. 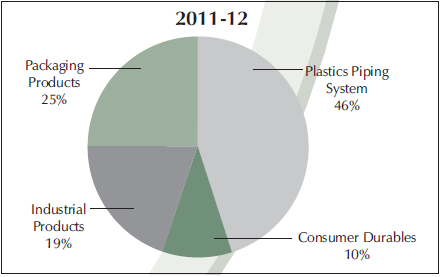 In 2012 the margins are well above previous years.In 2012 material cost was 65.9% as compared to 66.25 in 2011. 3 OP margin are also fine and has increased in last year due to less SGA cost of 14.1% as compared to 15% in Fy11. 2 Net profit margin has increased over last years It is due to less material cost, less SGA cost and also on account of reduction in interest payment on debt. Considering all parameters , NP margin is still less compared to companies in other manufacturing industries.It should be around 10%.We need to watch this parameter in future. 3 SGA cost are under control and have actually reduced over last few years. 2 Depreciation is on higher side. It is improving but still further improvement in necessary. 2 Interest cost has reduced significantly.Company has good earning power and is able to pay off its debt. Company has paid off 163 Cr long and short term debt. It has debt of 351cr as of june 2012 as compared to 511Cr in fy12. 2012--240.52 4 Sales have increased at avg rate of 18.3% over last 5 years but Net profit has increased at rate of 48% during last 5 years which is impressive. 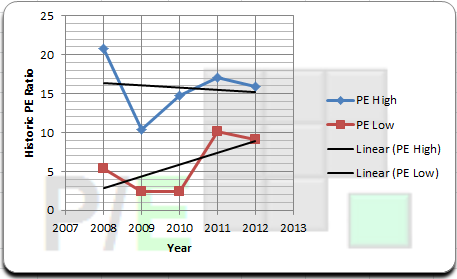 Net profit has grown more than sales as net profit margin has expanded from 3% in 2008 to 8% in 2012. 2012--18.93 4 EPS growth rate is good.In 2010 it is shown negative as stock split happened , new face value was 2.In real terms eps increased by 20% in 2010. 4 Company is consistent dividend paying player. 2012--314.01 4 Inventory is well under control. Plastic pipe form the major segment with 46% of revenue coming from it.It has 9.5% market share of plastic pipe market.SIL is a dominant player in the packaging products segment, which constitutes 25% of its business currently.SIL is the second largest player in manufacturing of moulded plastic furniture, which constitutes 10% of its business currently.It has 13% market share of moulded plastic furniture market estimated at Rs 2000 crore. So Company is among the top 3 market leader in all categorie s in which it operates. Company has got a good brand value and has a good distribution network 4 Management team is proactive.Company is adding more innovation products each year.In nest 2 years it plans to launch Hi-Tech SWR system, Bath room fittings, composite LPG cylinder.SIL has earmarked capex of Rs.75 crore for making a facility for manufacturing LPG composite cylinders with an initial capacity of 5 lakh cylinders per annum at Halol Gujarat and the plant is expected to be on stream by end of March 2013. Management has taken steps to keep debt under control inspite of aggressive expansion plans. 3 Current ratio is fine and it is improving over last few years. 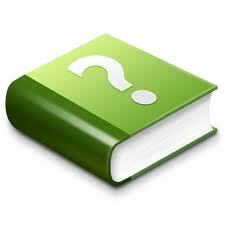 Company can meets its short term needs without any problem. 4 Debt to equity ratio is comfortable at .4.Company is using its earnings for expansion and for paying off its debts. 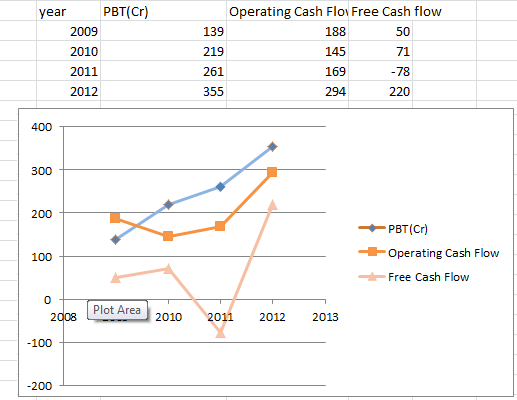 2 Company has strong operating cash flow which can be seen from below. But company is in expansion phase and it needs to keep on adding more plant and equipments. In 2011 , company spent 258 Cr for increasing capacity of existing plants and to add one new plant at Sriperumbudur.In 2010 , company spent 79 cr for capex needs.In 2009, company spent 160 cr on construction on commercial complex in Mumbai. 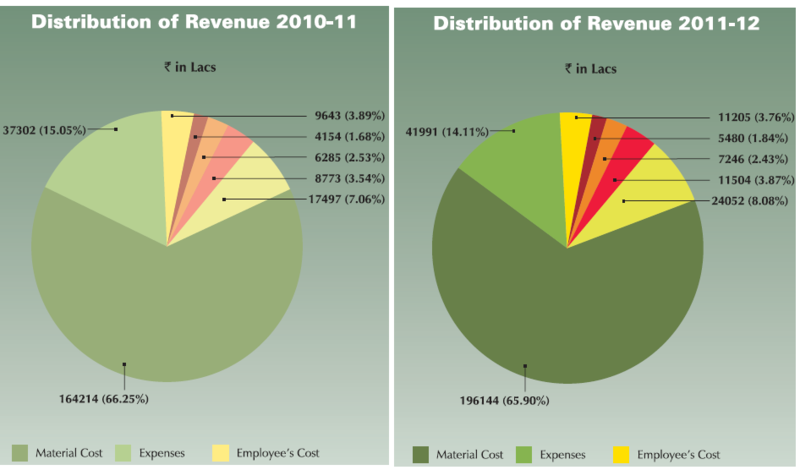 3 Return on equity is consistent and is improving , it is 37% in fy12. ROE seems to be inflated as company is using financial leverage to fund its operations and expansion. Return on assets is also at good level. 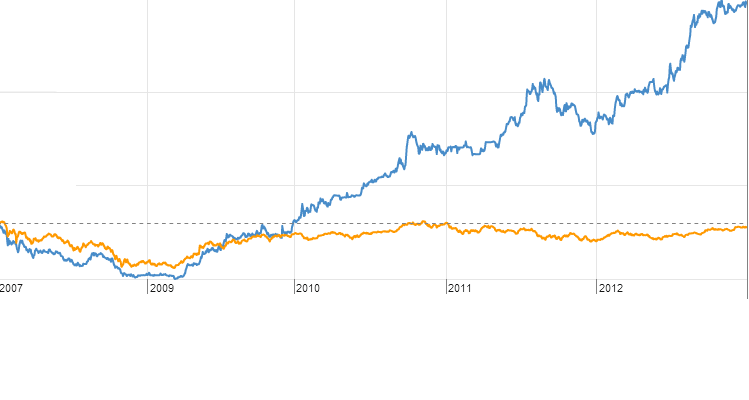 Sun Pharma has a shown a very good chart for last 10 years , same for ITC and Colgate. These companies has shown that they were not very much impacted by various sow downs that we have seen in last 10 years. 17 graph of stock price Graph of company is very smooth. 4 Stock price had a very good run in last 2 years. It was 148 in december 2010 and 295 in december 2012. 2012--616.06 4 Retained earning growth rate has been impressive. retained earnings have been used for capacity expansion for paying dividends and for paying off debt. Avoid companies with unrealistic P/E ratio , some companies may be operating at a P/E of 40-60 or even more.Market is assuming that these companies are going to grow at 40-60% per annum.In most cases , companies fail to deliver that much growth 19 P/E ratio P/E stands at 15.5 in December 2012.
and the company is a mid cap with market capitalization of more than 3000cr so P/E looks fine but upside in P/E should be limited.We need to watch how company capacity expansion improves the sales and net profit.If all is fine then P/E can be rated again but as of december 2012 it is valued reasonably. Internaly developed brand value is not mentioned as assets on balance sheet. We should look for companies which have good brand value.Asian Paints , Titan etc have brand value of thousands of crores due to which they enjoy leadership in their respective industries. Check if company has good brand value and other intangible assets 20 intangile assests , brand value and does a company have advantage over others Company has strong product portfolio with more 5500 product types.It has strong distribution network.It is among top market leaders in the segments which it operates in.It has good good brand image for its products. Company has pan India presence. It has 20 manufacturing plants as of June 2012 and plan to have 22 plants by March 2013.SIL has a wide distribution network all across India with 2052 channel partners and 25000 retail counters. Company has entered into technical collaboration with international players like Rasmussen polymer development, Foam Partner from Switzerland.Kumi Kasai and Sanwa Kako from Japan. So Company is taking right steps to further enhance its brand image. 4 Company bought back 22,16,300 shares in 2009 for 24.9 cr. Impact of Industry parameters and Government policies Company is still in growth phase. It is adding more and more products regularly , product count is more than 5500 as of june 2012. It is adding more innovation and value added products. 4 Company has better NP margin as well as ROCE over its competitors. Astral poly is a small competitor but it has been growing at a rate of consistent 40% over last 5 years.So among others Astral poly is the company to watch in future. For e.g Energy companies had their time in 90s .Telecom had their time from 2000- 2010 , now companies in telecom industry are in strong competition.Information Technology has almost seen its best part from 1995 to 2010 now the industry has become stable and is growing at 10-12% rate. We should have strong reasons to believe that the company will continue to grow in future and can mention all these factors in this section. 25 what company does ,your story on company , why do you think that company will become better than what it is today, or any other point Company has a good growth story.It has good brand value , good connection with suppliers. It has well managed distribution network. 1.Its performance is highly dependant on raw material cost .Raw material cost around 65% of revenue out of which PVC constitutes 45% of the total raw material costs. 2. Company needs to keep on spending on plant and equipments to keep growth going. Besides competition from organized player, company faces competion from local players as well.The unorganised sector has over 60% market share of the total plastic industry. 4 Company has planned capex of 1100 Cr from from Fy12-16. It needs this money for capacity expansion , adding new plants and also adding new products. This is a huge amount of capex compared to what company earns 250cr as of Fy12. Now company is planning to fund this expansion from its earnings.If it able to do so then it is really good but if it funds it expansion by using lot of debt then we should avoid this company. Current debt level is at comfortable level with total debt of 351 cr compared to 250Cr of annual earning. But the growth story remains good.We need to also see how this expansion helps the company to increase its earnings.